In the central parts of Fyn (the Funen) lies some sandy hills with a flora normally seen in the sandy parts of Jutland. 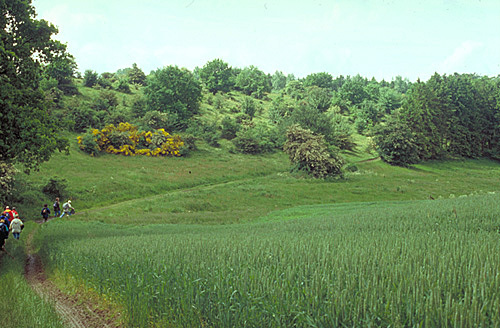 Some of the hills are a nature reserve ("Rødme Svinehaver") and part of the Natura2000 network both because of the landscape and the vegetation which is rare outside Jutland. With funds from EU the heavy vegetation og trees and bushes on the hills have recently been removed so the rare grassland vegetation can spread. 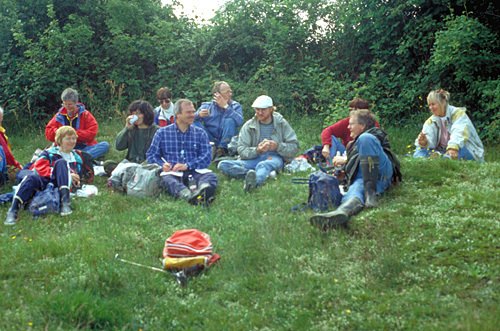 The pictures are from an excursion with Danish Botanical Society to the shrubby grassland "Rødme Svinehaver" in 1995. The members of the excursion enjoys their lunch.